Set in San Francisco in 1985, Test is a portrait of Frankie, a shy young dancer caught in the anxiety and fear of the AIDS crisis. A sensitive study that captures the tense atmosphere in which the HIV test became available and men were faced with knowing, but not being able to change their fates. Starring Scott Marlowe, Matthew Risch and Kristoffer Cusick. Written and directed by Chris Mason Johnson. “As Frankie, Mr. Marlowe delivers a quiet, moving performance of such subtlety and truthfulness that you almost feel that you are living his life.” — Stephen Holden, The New York Times. Test screens Monday, September 15 and Tuesday, September 16, 7:00 and 9:00 at the Trylon. You can purchase tickets here. The satirical thrust is The Blue Angel, also perhaps Nabokov’s “Ode to a Model,” whipped up by Rainer Werner Fassbinder into something like the greatest women-in-prison movie. Cats on a darkened staircase comprise the opening tableau, the camera pulls back to contemplate the studio-boudoir-dungeon where Petra (the phenomenal Margit Carstensen) is roused from slumber like a vampiress. A high-fashion doyenne, she presides imperiously from her bed, dictates a letter to a certain “Herr Mankiewicz” (“There are circumstances between heaven and earth…”), and grabs her silent servant (Irm Herrmann) for a terse pas de deux scored to The Platters, neither one looking at the other. “Easy to pity, hard to understand,” she says, the motto of a tough woman ruthlessly controlling hard-won space. (A naked Bacchus dominates the billboard-sized Poussin mural in the background, the phallocracy of the outside world petrified but always looming.) Yet Petra’s hauteur is little more than the sum of her wigs and façades, all it takes is rejection from her plebeian Galatea (Hanna Schygulla) for it to unravel. An audience of limbless, staring mannequins savors the spectacle: “That’s how oppression comes, quite automatically.” Relationships to Fassbinder are waltzes of power shifts and eclipses, life’s “codes of behavior” are laid bare as the frozen, flattened poses of melodrama. His characters spear each other with words only to beg for forgiveness, weep through blank visages, laugh raucously without the slightest hint of mirth. Throughout, Michael Ballhaus’ camera languidly circles and zooms, pinning actors to cluttered décor in one hyper-concentrated composition after another. Sprawled on the wasteland of a terrycloth rug, clutching a doll and a bottle of gin, Petra is Medusa brought to her knees, spitting fire at friends and family. “My daughter loves a girl,” mutters her dazed mother. “How peculiar.” A frigid hothouse in four acts and one epilogue, the equal of the best of Losey or Duras. The crushed tea set of the bourgeoisie yields to a throb of Verdi, “The Great Pretender” trumpets a working-class insurrection, then lights out. With Katrin Schaade, Eva Mattes, and Gisela Fackeldey. 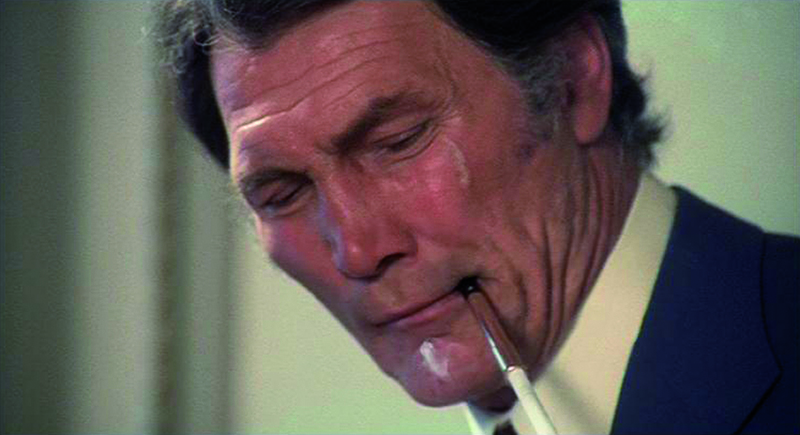 This review originally appeared on the film blog Cinepassion, and is reprinted by permission. The Bitter Tears of Petra Von Kant runs Friday and Saturday, September 12 and 13 at 7:00 and 9:30, and Sunday, September 14 at 5:00 and 7:30. You can purchase tickets here. Beware “The Blob” — At the Pioneers and Soldiers Cemetery! UPDATE: Due to inclement weather, this event has been rescheduled for Wednesday, September 17. Reach down and pick up the nearest stick. Poke and prod the life form until it cracks open, hopefully revealing a small, gelatinous blob. It has? Go ahead and push said stick inside of life form (i.e., The Blob) until it is determined to eat both you and the rest of your species. That, after a surprisingly groovy song, is how The Blob begins, and it sets the tone for the rest of this enjoyable classic. 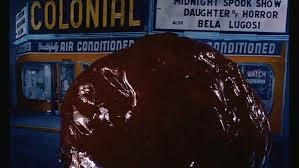 It should be noted that the Blob itself is only one of two aliens in play. Steve McQueen exists on an entirely separate planet from everything else in this film. While the rest of the cast manages to, mostly, deliver their lines, McQueen manages to oddly convey great depth of character. In a movie about a man-eating blob. It’s fun to watch. So grab a stick friends. And probe The Blob until it opens itself up to you. Then act surprised when it won’t let you go. As an Explorer, Ben hopes to one day visit the old oak tree at the end of Petaluma. Because it’s his dream, he can touch it if he wants. The Blob screens at, and as a benefit for, the Pioneers and Soldiers Cemetery in Minneapolis. The cemetery is located at the corner of Lake and Cedar in Minneapolis. The movie begins at dusk, and you can purchase tickets here. Mohammed Rasoulof’s Manuscripts Don’t Burn (2013), filmed secretly inside Iran and smuggled out of the country for its premiere at Cannes, is an angry and at times despairing meditation on censorship, betrayal and state-sponsored violence. Its sense of outrage at a repressive government recalls Costa-Gavras’ 1969 thriller Z but the odds against the good guys are far more intimidating here; the brutal regime Rasoulof evokes doesn’t just dispatch threats to its power, but mercilessly extinguishes any and all dissent. This is a government that is careful not to make martyrs, stripping its enemies of every last shred of dignity before destroying them. Khosrow and Morteza are freelance operatives working for the regime, and while they are capable of chilling brutality they are also depicted as quite human. Khosrow worries about his sick child and the money he needs to pay for medical treatment, money that’s been promised to him but which never seems to arrive in his bank account. Morteza, the more experienced of the two, offers his prayers and encouragement, and calls in favors to help with the child’s treatment. And every day the two carry on with their routine job: kidnapping, torturing and murdering the enemies of the state, a group that includes anyone who dares speak above a whisper. Their overseer is himself a former dissident, who switched sides to become a government censor and interrogator. He is now dedicated to terrorizing his former friends, a dismayingly small band of aging writers and intellectuals. All have vivid memories of a botched assassination plot against them two decades ago, and some have recorded their recollections of the incident. But the government ruthlessly hunts for every scrap of evidence, determined to erase history itself. “The only thing this government does well,” one of the characters observes, “is turning intellectuals against one another.” The dissident’s precarious position is underscored by the constant humiliations they must endure: one is in a wheelchair and incontinent; another pleads to be let out of the country before he dies; another seems too hollowed-out to care about much of anything. But somehow they stubbornly, almost miraculously, cling to the notion that their work is important, that it can make a difference. They feel certain that if only their voices are heard, they will be able to change things for the better. And even if they can’t, the mere act of speaking out is a right they refuse to cede. You might argue that the film doesn’t offer much hope for these aspirations. But Manuscripts Don’t Burn itself stands as an act of courage and defiance. This is a tough and daring movie; Rousolouf’s name is the only one credited in the film. The cast and crew, some apparently non-professionals, remain anonymous in order to protect their identities. Manuscripts Don’t Burn screens at the Trylon Monday and Tuesday night at 7:00 and 9:15. Purchase tickets here.